There is such a thing as a good problem, and the Astros have plenty of them. The organization's Triple-A affiliate in Fresno featured as much Major League-ready talent as any team in the Minors, but the 2017 World Champions had one of baseball's toughest rosters to crack. Plenty of familiar faces posted gaudy numbers that could not go unnoticed and other up-and-comers forced their way to the doorstep of the Major Leagues. Beyond the Pacific Coast League and this list of All-Stars remains a deep prospect pool. Forrest Whitley, MLB.com's top pitching prospect, suffered a down year after a series of injuries and a drug suspension. J.B. Bukauskas and Corbin Martin both fell short, despite excellent sophomore campaigns. And 2018 Draft picks Seth Beer and Jayson Schroeder announced their presence with authority. If the Astros want to subscribe to a "next man up" mentality, they certainly have the horses to pull it off. Catcher -- Garrett Stubbs, Fresno (84 games): With catchers Martin Maldonado and Brian McCann headed for free agency, the club's 15th-ranked prospect enjoyed an excellent campaign to earn some Major League playing time in 2019. Stubbs displayed an impressive ability to hit for average early in his career but needed to rediscover that tool after a down year in 2017. What resulted was a 78-point jump in batting average as the 2015 eighth-rounder compiled a .310/.382/.455 slash line with 29 extra-base hits and 39 RBIs in his first full season at Triple-A. At 5-foot-10 and 175-pounds, there are some concerns about Stubbs' size and durability, particularly as a backstop. He played 75 games behind the plate, making five errors and throwing out 19 of 42 would-be basestealers. Despite any doubts, he's shown he has the skill set to stick at the position. First baseman -- AJ Reed, Fresno (123 games): The 2017 Bauman Award winner led the organization with 28 homers and 108 RBIs in his third Pacific Coast League stint. 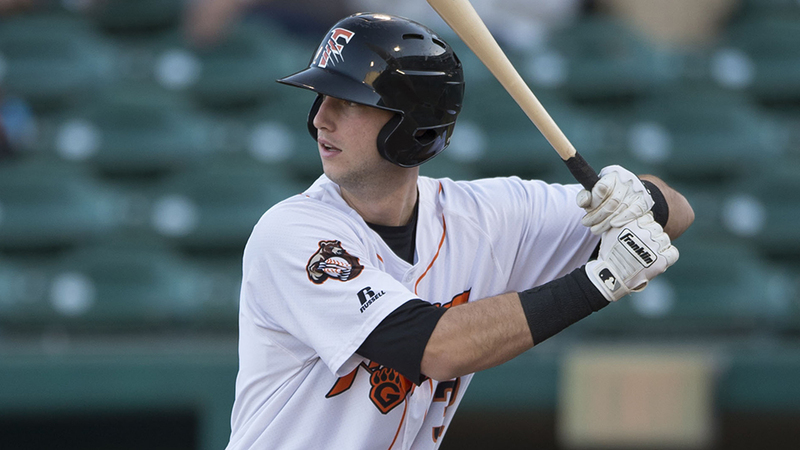 Reed made his Major League debut in 2016, but the fifth-year pro closed in on a number of Grizzlies hitting records after being limited to nine big league at-bats over the past two years, a period in which he's led all Minor Leaguers with 212 RBIs. Astros manager A.J. Hinch told MLB.com before the season that Reed hadn't "been given full opportunity to show what he can do," but a similar situation again denied a September callup for the 25-year-old. But the 6-foot-4, 275-pounder persevered, batting .255/.344/.506 with 72 runs scored, 64 walks and 24 doubles, his fifth consecutive season with at least 20 two-baggers. "There are 29 other teams out there and they're always looking. You've got to keep playing hard and doing what you can do for those other teams," Reed told the Terre Haute Tribune-Star in October. "I'm a guy who's going to hit home runs and have RBIs. The goal is just have as many as those as possible. That's how I'm going to help a team the most." Second baseman -- Jack Mayfield, Fresno (113 games): The 28-year-old Texan signed with the Astros in 2013 after going undrafted out of the University of Oklahoma. His sixth professional season started with his first invitation to big league Spring Training and ended with career highs in doubles (31) and walks (33). Mayfield nearly matched his production from a strong 2017 season, batting .270/.324/.457 with 16 homers, 66 RBIs and 66 runs scored. The 5-foot-11, 190-pounder is a versatile and reliable defender up the middle, committing 10 errors in 62 games at second base, 48 at shortstop and four at third. Third baseman -- Randy Cesar, Corpus Christi (116 games): A Texas League-record 42-game hitting streak highlighted a free agent season for the 23-year-old corner infielder. Cesar was signed out of the Dominican Republic in 2011 and played his first full season last year. He's been a consistent hitter throughout his professional career and batted .296/.348/.428 with 10 homers, 62 RBIs and 59 runs scored during the regular season. But the record-breaking streak provided a glimpse of something special. "It's the longest [streak] I've seen in person," Corpus Christi hitting coach Troy Snitker told MiLB.com. "It's been really impressive over such a long period of time. A lot of things have happened. He's battled multiple injuries, gone down to the wire multiple times. "He also started off the year as kind of maybe the guy teams are not going to target as far as a guy pitchers are going to stay away from, and now he's the guy they say, 'We're not going to have him beat us.'" Cesar batted .391/.428/.627 with 66 hits, including eight homers, two triples and 12 doubles, 30 RBIs and 28 runs scored during the streak. He split time almost evenly between third and first base, with the bulk of his time coming at the hot corner. Shortstop -- Freudis Nova, Gulf Coast League (41 games): The Astros invested $1.2 million and a great deal of patience in bringing Nova into the organization, and the 18-year-old paid dividends in his first year stateside. He batted .308/.331/.466 with six homers, three doubles, 28 RBIs and nine stolen bases in Rookie ball. His quick hands and arm strength rate well, but his defensive consistency needs work. Luckily, Nova and the organization can both afford to be patient in his development. Kyle Tucker, Fresno (100 games), Houston (28 games): MLB.com's No. 5 overall prospect was the Astros' Minor League Player of the Year after leading the organization in runs (86), hits (135), extra-base hits (54), doubles (27), slugging percentage (.590) and OPS (.989). The club's top prospect batted .332 with 24 homers and 93 RBIs and earned his first big league promotion in July. "His bat-to-ball skills are second to none. He's really impressive to watch," Fresno manager Rodney Linares said. "You can see him hit in a game and it looks like he had never hit in his life -- he can get fooled by three breaking balls in a row. But if he comes back up again, that breaking ball better be in the dirt. Because if not, he's going to hit it out of the park." The 21-year-old had a hard time translating his success to the Majors and was 9-for-64 (.141) with four RBIs in 28 games over three stints in Houston. A terrific August help him force his way back onto the Major League roster after the Pacific Coast League season ended. He led the PCL with a .471 average, .542 OBP, .943 slugging percentage and 1.485 OPS and added 10 homers and 27 RBIs in 17 games. "He dominated the Minor Leagues," Hinch told MLB.com, insisting that Tucker has a shot at the Astros' Opening Day roster next year. "I think he's got to come up with a 'B' swing that will allow it to be more adjustable to different styles of pitches and different ways that guys attack them. We talked a little about his mechanics, about what he's learned, the different pitches he's seen in the big leagues. I told him to come win the job next year as an outfielder." Yordan Alvarez, Fresno (45 games), Corpus Christi (43 games): The 21-year-old tapped into his power potential in his second full season, posting career highs with 20 homers, 74 RBIs and 21 doubles across two levels. "It's all about creating a swing path that allows him to make the most of that power," Corpus Christi manager Omar Lopez told MiLB.com after Alvarez's second-career multi-homer game on May 2. "It's just about getting his reps, and that's exactly what he's doing. He's physically stronger, too, and seems like he's working more on cardio and his lower half. It's coming together well." Alvarez batted .325/.389/.615 with 12 homers and 46 RBIs in the Texas League. Houston's third-ranked prospect had a one-game stint in Fresno in June and came back up for good on July 6, sporting a .259/.349/.452 in his final 166 at-bats of the season. The 6-foot-5, 225-pounder is rather spry for his size and has the athleticism to be an effective corner outfielder. Myles Straw, Fresno (66 games), Corpus Christi (65 games): The 349th overall pick in the 2015 Draft earned his keep with 70-grade speed that secured a spot on the big league postseason roster and his status as the Astros' No. 14 prospect. Straw led all of professional baseball with 70 stolen bases, finishing atop the PCL leaderboard with 35 and coming in second in the Texas League behind teammate Stephen Wrenn's 44. "It's the same as it's been ever since Rookie ball," Straw told MiLB.com. "They want me to go when I get the chance. Deep down, I know that's my talent. If I can steal a lot of bases, that's what is going to get me my shot at the Major Leagues, which is the main goal for anyone in this game. I'm going to use it in any way I can to make that goal happen." The 24-year-old batted .291/.381/.353 with 24 extra-base hits and 31 RBIs across both levels, totaling a career-best 150 hits and 95 runs scored. Designated hitter -- J.D. Davis, Fresno (85 games), Houston (42 games): Like Tucker, the 25-year-old earned a place in the Majors but struggled to stick at the next level. He played 42 games with Houston, nearly twice as many as last year, but batted .175 with one homer and five RBIs. Back in the Minors, Davis was one of the most prolific run-producers at any level, collecting 81 RBIs in 85 games. He led all Astros Minor Leaguers with a .342 average and .406 on-base percentage while bashing 17 homers and 25 doubles. Right-handed starter -- Josh James, Fresno (17 starts), Corpus Christi (six games, four starts), Houston (six games, three starts): The flamethrowing 25-year-old was named the organization's best pitcher after enjoying a breakout season that ended with a big league bullpen spot in the playoffs. The club's fourth-ranked prospect led Astros farmhands with 171 strikeouts -- fourth-most among all Minor Leaguers -- while posting a 3.23 ERA over 114 1/3 innings. James' arsenal is led by a fastball that used to top out in the low 90s but can now reach triple digits. He says the reinvigorated pitch is the result of a medical treatments for sleep apnea, a discovery he made prior to last season. The 2014 34th-rounder made six appearances, including four starts, at Double-A, posting a 2.49 ERA and 38 strikeouts in 21 2/3 innings. He was used exclusively as a starter with Fresno and registered a 3.40 ERA over 92 2/3 innings in the PCL before earning a Sept. 1 callup. A 2 2/3-inning scoreless performance in his second Major League start tipped Hinch to an idea for the near future. "We started talking a little bit about what he could do maybe in the 'pen," the skipper told MLB.com. "And then we had a spot start available and he came up and did exactly what he had been doing in the Minors -- struck out guys, calm demeanor, plus stuff across the board. And he stuck." Left-handed starter -- Brett Adcock, Buies Creek (16 games, nine starts), Corpus Christi (nine games, five starts): The 2016 fourth-rounder thrived in a piggyback rotation in the Carolina League and continued that success at the next level. Adcock did not allow more than four runs in any given outing and finished with a 9-5 cumulative record, 2.89 ERA and 95 punchouts over 106 innings. The Astros' No. 27 prospect logged 10 appearances in which he did not allow a run, making three consecutive scoreless appearances early in the season before riding a four-game shutout streak into his Texas League debut. "I obviously have things I need to fine-tune; if I didn't, I'd be in the big leagues right now," the University of Michigan product told MLive.com before the season. "I'm just trying to make myself 1 percent better each day. If I can do that, hopefully, I can end up in the right place." The 23-year-old showcases a low- to mid-90s fastball with two breaking pitches that grade out above average. He was incredibly tough on left-handed hitters at both levels, holding them to an .041 average in the Carolina League and a .143 mark in the Texas League. Relief pitcher -- Dean Deetz, Fresno (21 games), Corpus Christi (three games), Quad Cities (three games), Houston (four games): The 24-year-old right-hander overcame an 80-game suspension and climbed from the Midwest League to his Major League debut. Deetz had a shot at the big league Opening Day roster before testing positive for a banned substance in January. "It was tough," the Astros' No. 18 prospect told MLB.com. "I wasn't ready for it at all. I got a call literally three or four days after I got put on the [40-man roster]. I went from being really excited to the toughest news I ever heard. My family helped me get through it. Just working in extended [spring] through my suspension and working with everyone helped me get through it." Deetz pitched three innings for the River Bandits and 3 2/3 frames for the Hooks before returning to Fresno in late June, allowing three runs over 34 innings (0.79 ERA) while notching 50 strikeouts in the PCL. An injury to reliever Hector Rondon in early September created the opportunity for Deetz's first call to the Majors.